I never really do many hair posts so decided today shall be the day that I talk about the products I'm currently using and loving. My hair routine doesn't change much in terms of products and I've been using these for at least a good three months now but because they leave my hair feeling nice and healthy I stick with them. I do however change how I style my hair so depending on my mood will depend on the hair tool I use. Starting with the products I use in my hair when it's wet. 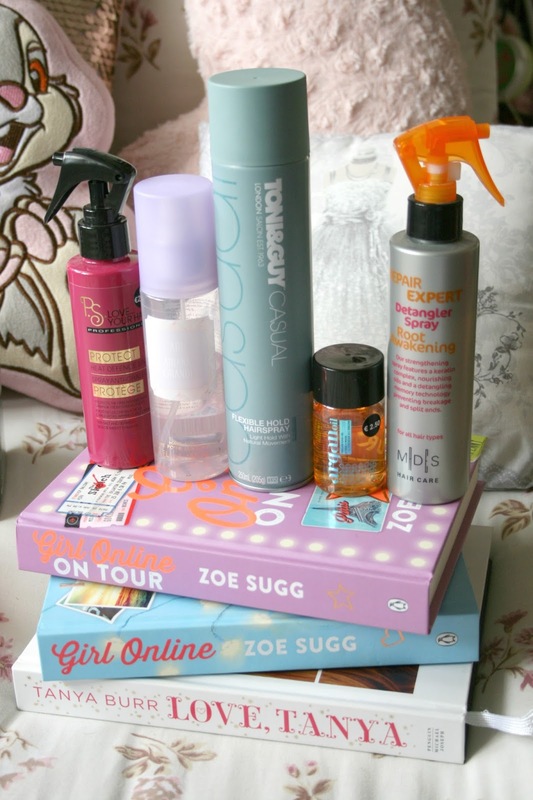 Firstly to help with de-tangling my hair I'm loving the MADES Repair Expert Detangling Spray*. I got sent this last year and have really been loving it again. I stopped using it after I trialled it out and about three months ago I started using it again as my hair got very dry and knotty again after bleaching it. What I really like about this spray is that it is aimed at those of us who may have colour damage, and so it contains features such as keratin complex and nourishing oils to help your hair stay as healthy as possible. In my opinion it smells like orange starburst and well it's kind of addicting when you start spraying it. I find that this definitely works a dream as when I don't spray this in my hair it takes double the amount of time to de-tangle my hair. I also like that it's very light and you don't feel any residue in your hair after spraying it. I simply brush it through my hair with my Tangle Teezer and then I'm good to go. I then like to add some Argon Oil to the ends of my hair and work my way up. I got this little tub from Primark for just €2.50 and it's lasting me forever. This is perfect for any damaged ends you may have as it just helps them to sit down nicely. You can also use this on dry hair to tame your ends but I usually just use it when my hair is damp. Be careful not to put too much on though as it can leave your hair looking greasy if you go overboard. For my heat protector spray I'm currently working through the PS Love Your Hair Heat Defence Spray which is from Primark and I bloomin love it! This is lasting me absolutely ages and it only set me back €2.50 which is such a bargain. Of course I then have to spray in some of my Ari by Ariana Grande Hair Mist because it just smells so good! I've never owned a hair mist before this one and I am so obsessed with it. I spray it all in my hair and brush it through and it just leaves my hair smelling so lovely. I also spray this when my hair is dry at random times in the day because why not!? It has the same scent as the Ari fragrance which is my current favourite! I'm halfway through this bottle at the moment and as soon as I run out I'm definitely re-purchasing it. I've been really lazy lately in the fact that I will let my hair dry naturally just because blowdrying it takes way too long to do. But when it is eventually dried I've been really enjoying styling my hair with the Toni & Guy Deep Barrel Waver*. I've wrote a post all about this tool here if you'd like to read more about it. The tool just creates the most gorgeous waves I ever did see and I am so obsessed with my hair when I style it this way. I get so many compliments on it too when I wear it in waves, it's the perfect tool if you're looking to achieve some mermaid waves for Summer! Finally after styling my hair I simply set it with some of the Toni & Guy Casual Flexible Hold Hairspray*. I really like how light this hairspray is, it's not sticky like other brands and you can brush it out easily. It also holds your hair in place no matter the weather, I went out with my hair styled in rain, wind, sun, snow you name it and it stayed in place thanks to this little gem! What are you currently using on your hair? Now I have them, I couldn't live without Tangle Teezers! I have an original one and a compact one that I take with me everywhere, and I feel lost without them if I don't have them on me. I never really style my hair, as I'm trying to get it as healthy as possibly after bleaching the ends and I hate the thought of cutting dead, split ends off again. So to maintain shine I use the Garnier hair oils after every wash! I had no idea Primark did hair care now, so I should probably go and have a look at their products!